Walking down Calle Crisologo, a pedestrian-heavy cobblestone street surrounded on both sides by open storefronts and Spanish architecture, it’s easy to feel as though I’ve been transported back to Europe in the 1600s. Especially when a horse carriage known as a calesa comes ambling down the street. And when dusk settles in and the street warms with mood lighting courtesy of small lamps on the front of each building, the old-world feeling becomes even stronger. 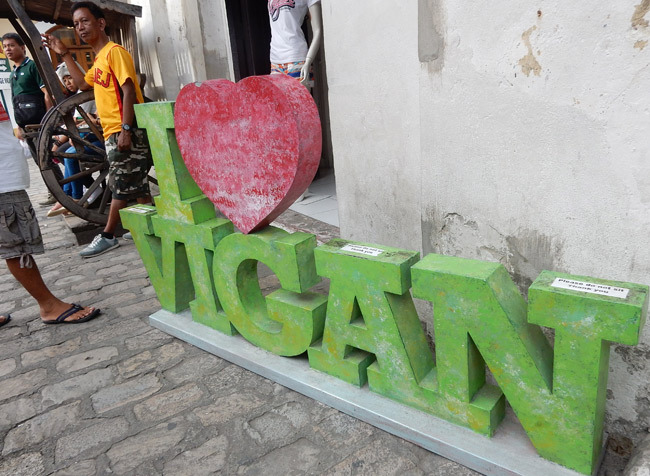 I’m in the Philippine city of Vigan, which has elements of Spanish, Chinese, and Filipino cultures woven together. Vigan was settled (taken over, actually) by the Spanish in 1572, and their influence remains in the colonial architecture. 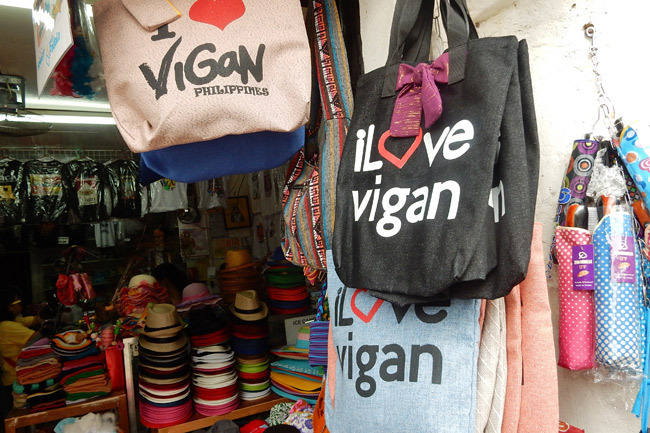 Before they arrived, Chinese traders regularly visited Vigan and many stayed in the area, so all of these influences and ethnic groups melded to create Vigan as it is today. That unique history was recognized in 1999 when the city of Vigan was named a UNESCO World Heritage Site. 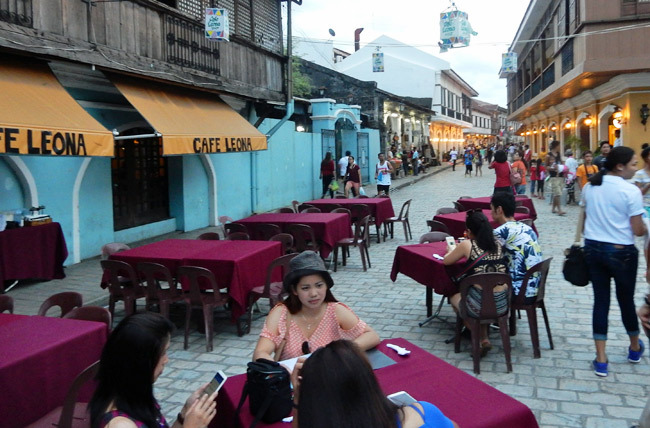 The organization called the city “the best-preserved example of a planned Spanish colonial town in Asia.” Vigan was also recently named one of the “New 7 Wonders of the World,” along with cities like Havana, Kuala Lumpur, and Beirut. The capital city of the Ilocos Sur province, Vigan is bursting with history, but it also has a modern side – as seen in the nightly laser-light fountain show in the plaza featuring the music of current hitmakers like Silento and Maroon 5. 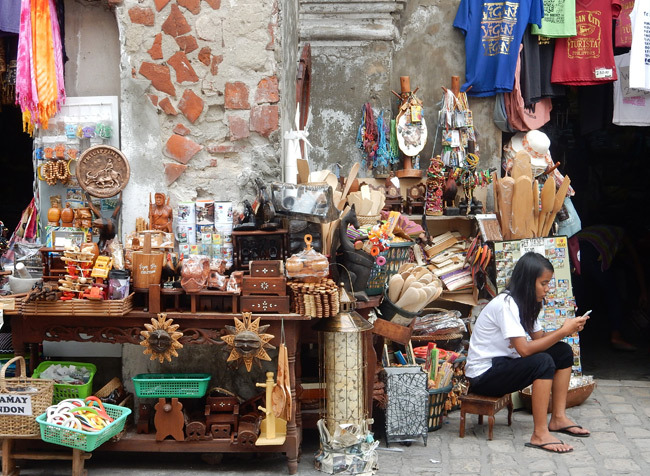 Vigan is not as touristy as some of the beach towns and major urban centers of the Philippines, but the history and culture here make it a fun place to visit. Calle Crisologo should be one of the first stops for any visitor. The shops here sell gifts, clothing, jewelry, crafts, snacks, and souvenirs. 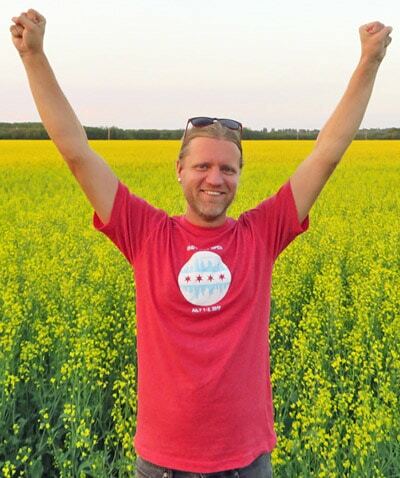 While meandering through the stores, I received some smiles, as well as a few blank stares from locals who were probably not used to seeing a dude with long blond hair wandering around the mestizo district. You can haggle here, but a lot of the people working in the shops during my visit were teenagers, and I didn’t feel comfortable negotiating with kids. Especially when the fridge magnet I wanted was 35 pesos, and haggling down to 30 pesos would save me the equivalent of one U.S. dime. So I paid sticker price and moved on to the next shop. Further up the street beyond the gift shops were a handful of outdoor cafes and restaurants. The street was busy at all times of day, except when a storm moved in at night – summer is the rainy season, so be prepared! 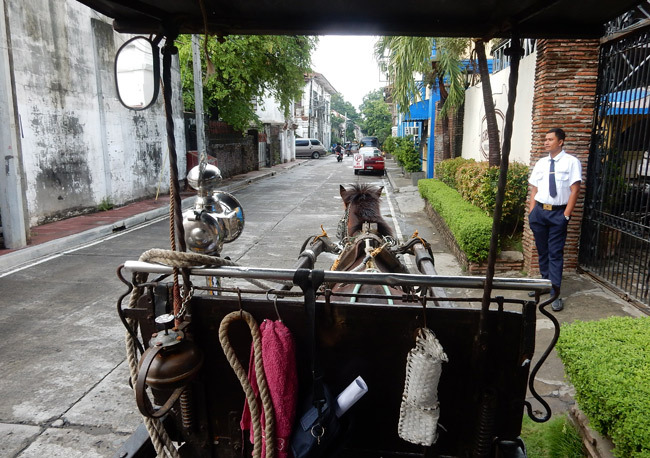 Calle Crisologo is closed to vehicles except for calesas, the horse carriages that were used in colonial times. 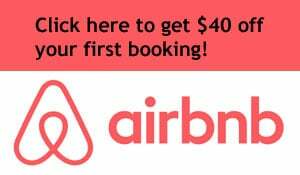 Because they are convenient and inexpensive, visitors often use them to get around or to experience the novelty of the old-fashioned method of transport. 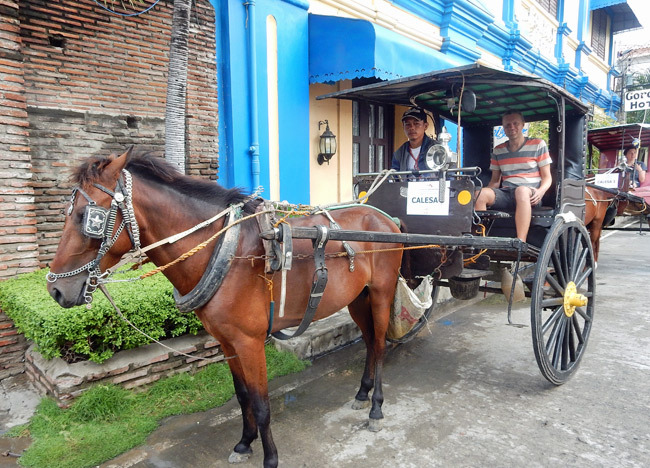 You can ride calesas all over Vigan, so they’re an easy way to get to attractions like the Bantay Bell Tower or the Syquia Mansion. The experience of riding in a calesa is much like you’d think it would be. The calesa is essentially a very slow taxi that affords ample opportunity to soak in the surroundings. It’s a good way to remind your brain to move away from the hectic U.S. mindset and adjust to a more leisurely pace of life. You can hail a calesa if you see one, or head to Plaza Salcedo where there’s a line of the horse-drawn carriages parked and waiting for business. If you’re feeling lost or experiencing too much culture shock, a small number of American stores (Guess, Lee) are located around the plaza. There’s also a McDonald’s, though if you’re seeking that type of cuisine, walk the extra block to reach Jollibee, the popular Philippine fast food chain specializing in spaghetti and chicken. Finally, it was off to Plaza Salcedo to see the “Dancing Fountain.” After dark, the city puts on a show using laser lights, music, and its fountain, which is choreographed so that it shoots up water to match the beats. The show is free and you can sit anywhere around the plaza. Just look how Silento’s “Watch Me” looks and sounds with the lights and fountain show! This was a cool way to finish the evening. Note: I was a guest of TBEX and the Philippine Department of Tourism during my visit to Vigan. The calesas remind me so much of pedicabs you can find throughout Asia. I loved the slower pace and sight-seeing opportunity. Wish I could experience the Phillipines and TBEX this fall. Sounds like a great place to explore! There’s so much to see in the Philippines. I have to go back to check out the beaches and mountains next time! 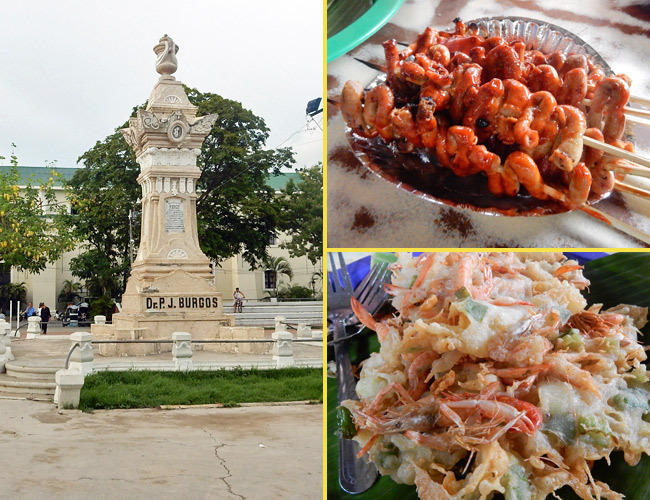 Vigan looks awesome and the food looks delicious. I have never been in a horse drawn carriage before, l have always thought it looks like a very romantic thing to do with a loved one. Yes, I rode in one in NYC too and it was a cool experience. It feels very old fashioned!